NASHIK: Altogether 102 private schools in the city have been found eligible to reserve 25% of their seats for the economically backward students living within a radius of 3km from school in playgroup or Standard I in accordance with the Right to Education (RTE) Act, 2009. All non-grant, permanent non-grant and self-financed schools have to ensure online admission to the underprivileged students under Section 12 (1) of the RTE Act 2009 for the 2015-16 academic year. The education department of the civic administration began with the online registration for private schools for 25% reservation from February 14. Till Tuesday, 102 private schools have got registered. Areas under the Nashik Municipal Corporation (NMC) limits have 117 such schools and the education department has found 102 institutes that match the criteria. “Of the 117 private schools, 102 schools can admit students under the 25% reservation have registered with us. The rest of the schools are minority in nature and Section 12 (1) of RTE Act 2009 is not applicable for those. We are expecting at least 2,000 students to benefit from the scheme,” an official in the education department said. He added that earlier there were 13 minority schools in the city but this academic year onwards two more had been added. “This online system of admission is being implemented in Mumbai, Pune, Panvel and Nashik for the first time and would be gradually replicated all over the state. The online system is not only quick but will also help in checking any malpractices for such admissions,” said the official. Online forms for admission will be filled in all the 102 schools. Besides, the NMC has also established 11 helpline centres for the parents. The last date for filling up the forms is February 28 and the admissions will be given by the schools from March 5 to 16. The hi-fi Google Map has put hundreds of parents, seeking admissions for their children through RTE, in a terrible dilemma. Many schools have been found missing in the Google Map. The areal distance between the residents of children and schools has to be measured through Google Map. But the missing schools in the high-profile website have put the parents on the edge. The online admission process through Right To Education (RTE) for academic session 2015-16 is commencing from February 23. According to RTE guideline, the areal distance between residents of children and schools should be between one and three kilometers for admissions. The distance has to be seen through Google Map. However, questions are even being raised over accuracy of the distance. The parents seeking admissions for children went on measuring the distance between residents and schools through roads. 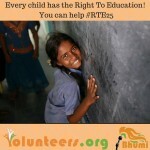 But the distance has to be measured by air route in accordance with the RTE guidelines. Here lies the mess. According to RTE rules and regulations, 25 percent seats in private schools are reserved for poor and backward class students. To avoid any major difficulties for parents, the State Government adopted online admission process. Subsequently, the Education Department issued necessary guidelines to schools. The guidelines include opening of assistance centres in all the schools, putting up of banners informing the parents about online process and other arrangements. Number to be decided, but plan is final, says new edu comm, for parents aggrieved with schools. With constant controversy surrounding school admissions under the Right to Education (RTE) Act, the education commissioner’s office has instituted a new toll-free number for aggrieved parents to lodge complaints, to be directed to local education officers to verify and resolve. The decision may come as a relief to parents attempting to admit wards in schools under the 25 per cent quota allotted by RTE to underprivileged categories, which some schools have been making difficult. The newly appointed commissioner of education, Dr Purushottam Bhapkar, on Wednesday announced the plan. A separate department running under the commissioner’s office will work as grievance redressal cell and also look after the helpline. “A number will be decided soon, but the plan is final. This will provide a centralised approach. If parents are unaware about whom to approach with complaints or if they are going unheard at the local level, they have a new avenue,” said Bhapkar. While the toll-free number is starting for RTE-related complaints, parents can also approach the education department’s office with other complaints, such as norms of the Fee Regulation Act, Capitation Fee Act or regulations around corporal punishment against children being flouted. The state education department has finally come out with the schedule of admission for the 25 per cent quota reserved for students belonging to the economically weaker sections of the society under Right to Education Act, 2009. Last year the online system for admission was introduced in the cities of Pune, Mumbai and Panvel. From this year, the online procedure will be implemented across many more corporations in the state. There will be a first round for school registration and the next will be for form filling after which the dates of lottery will be announced. The education department made clear that there would be no extension given to schools or parents in dates as the dates were being declared well in advance. The school registrations will start first on a pilot basis in Nashik. “We were facing an issue of different age groups. Uniform age across boards will be applicable from next year. This year, we have asked all schools to specify age limit while they register names of students in the software. This will help the parents as whenever they enter the details of their ward while filling forms, the child will be assigned to the schools nearest to their houses as per their age,” said Mahavir Mane, director, primary education. In Nashik, the school registration will be conducted from February 9 to14 and online form filling will be from February 16 to 28. In Pune, Pimpri-Chinchwad, Mumbai, Thane, Kalyan-Dombivali, Bhiwandi-Nizampur, Ulhasnagar, Mira-Bhaynder, Navi Mumbai, Nagpur, Amravati, Latur, Aurangabad and Kolhapur, the school registration process will begin on February 16 and continue till February 21. Online form filling will be conducted from February 23 to March 7 in these cities. Moreover, this year, help-centres will be kept open even during weekends so that parents belonging to economically weaker sections, who cannot leave even a day’s work, can avail the facility on holidays. “List of help-centres and verification centres along with list of required documents will be given on the website rte25admission.maharashtra.gov.in which will be soon operational. While the parents can apply online, they will have to visit the help centres, once, so that all documents are verified and there are no problems further,” said Dinkar Temkar who is deputy director of primary education, Maharashtra. Talking about the reimbursement that is yet to be received by private schools under RTE, Mane said that a proposal of Rs 26 crore had been sent to the state government. 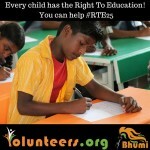 The government has also asked the Centre to give its 65 percent share in the RTE reimbursement. So, from next academic year (2015-16), the fee-reimbursement amount of 65% would be given by central government and the remaining would be given by state government, said Mane. Setting the ball rolling for online admissions for the 25% quota under Right To Education Act, the state primary education department on Saturday announced the process for this year. In the first phase, unaided schools will need to register themselves, which will be followed by students applying to schools of their choice. The government claims to have fixed the bugs that had marred the process last year. Under RTE, all schools, barring the exception of those having minority status, have to reserve one-fourth of their seats for underprivileged students from their vicinity. In its bid to ensure better transparency, the government had last year made it mandatory for schools and parents to take the online route. Addressing mediapersons in Pune, education department officials said schools from across the state will need to upload details such as entry level, age criteria and number of seats available under RTE on www.rte25admission.maharashtra.gov.in between February 16 and February 21. Schools claiming as ‘minority’ will be granted relief only after thorough inspection of their documents, they said. The portal will allow parents to go for the admission of their wards by filling the online forms from February 23 to March 7. To check the efficiency of the process, the department has decided to run a pilot project in Nashik and Panvel Taluka where schools will register themselves from February 9 to February 14, while parents will be allowed to do their bit from 16th to 28th of this month. The RTE online admission process saw 312 schools registering in 2014, of which one was taken off the list after being declared minority. However, chaos prevailed as parents began to fill the admission forms. In several cases, the system did not show all the schools in a particular area. Many schools were shown in wrong places. For instance, a school located in Chembur was shown in Bandra. The map on the system showed a few schools in the Arabian Sea. Nagpur: The admission process for the Academic Session of 2015-16 under the Right to Education (RTE) will begin from the first week of February 2015. This time the admissions will be on-line. This was informed by State Director of Education (Primary) Pune Mahavir Mane. He conveyed the same to the Primary Education Officer Kishore Chaudhary and other officials through Video-Conferencing. Till date, many officials of the education department and students and parents were apprehensive if the admission under RTE will be on-line or not. With the delay in directions and decisions from the government, scholars were of the opinion that the HSC examinations are beginning from February 21, 2015 while the SSC Examination are set to begin from March 3, 2015 and the Principals and Headmasters will be busy in preparation of conducting the examinations. In such a situation the process of admission in on-line format will not be possible. If sources are to be believed, the scheduled admissions in most of the small or big private schools are already completed in the month of December. Now these schools will have to restart the admission process under Right to Education. 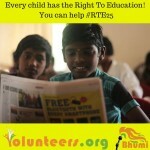 Many opined that the RTE should have been scheduled in the month of December. It is now mandatory for schools to admit at least 25% students from poor and economically weaker sections of the society. This is made mandatory to ensure that even poor students get an opportunity to study in reputed schools. According to information, the Education Department will have to open several Centres to complete the admission process in on-line format. For this schools will have to provide information to the Education Department about the 25% reserved seats. In this order, for the first time in Nagpur, the on-line admissions are going to take place in the first week of February. Admissions under RTE will be beneficial to students. There will be transparency in the admissions claimed Mahammed Shaheed Sharif of the RTE Action Committee.